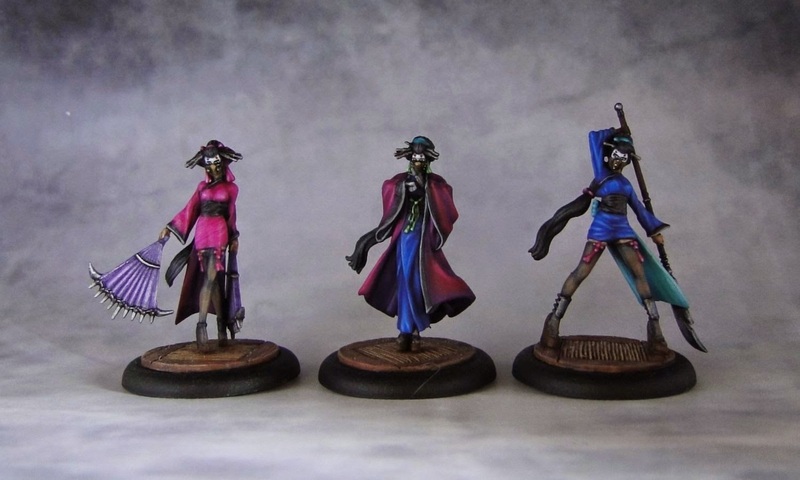 These are probably the most challenging minis I've ever painted for Malifaux. They are beautifully designed with an amazing number of details and really well defined features. What makes them so hard to work with is their size.They are just so tiny! It was a solid practice of highlighting small surfaces as well as a chance to work with colors I don't normally use. 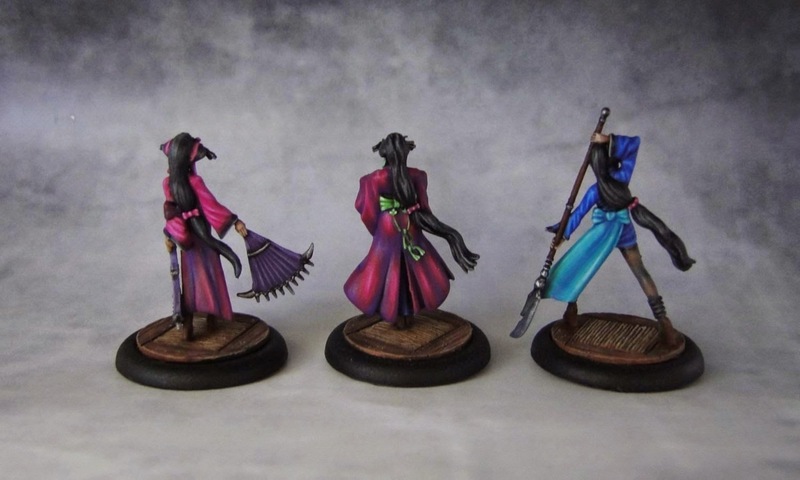 It's definitely a good idea to paint something that is not necessarily your style once in a while as it allows you to improve your painting skills. In game the Oiran are a very interesting minion. At mere 5ss they bring in an amazing ability in the form of Lure. It has an impressive range of 18' and (if successful, it's resisted by WP) forces a model to move its Wk towards the Oiran. It's easy to pull of with Ca8 and a built in mask as the TN is 12. The Oiran also give friendly models within 4' +1 to Wp. They also have a few tricks up their long sleeves in melee with some interesting triggers. And that completes my TT project. I'll write a summary of my work with this faction in a separate blog entry. For now I want to focus on preparing a few terrain pieces for my gaming board and after that I have quite a few Neverborn models to work on. Absolutely stunning job! Do you mind divulging your paint recipe for the stockings? I haven't been able to figure out how to get the sheer effect. Hi Ryan. Thanks for the comment, I'm glad you like them. I used only three colors here. Vallejo Extra Opaque Heavy Charcoal was used as a basecoat. I kept adding small amounts of Vallejo Extra Opaque Heavy Skintone for a few successive highlights and then started ading Reaper Rosy highlight (but any bright skin tone would do here). Keeping the paints watered down and applying numerous highlights is the key here. Hope that helps! Thanks! I've tried a black basecoat and mixing in gradual amounts of elf flesh from the old GW range, which is my usual skin tone, but it turns out more grey than I'd like. I'm trying to go for a look that is black with the skin tone peeking through without making it look grey at all. I've read up on a few other techniques that involve using Vallejo Smoke glazed over a black>grey>white undercoat, but we'll see how that works. Great job on all your paintjobs! I've been going through all your old posts and I really like how you get a dark look going without sacrificing detail. I find that the hardest part of dark tones is that it muddies detail, but you do a great job at keeping it.